Health benefits of noni juice include prevention of cancer, protection and healthy functioning of liver maintenance of cardiovascular health, relaxed muscles, relief from memory problems and conditions likegout and diabetes. The immense antioxidant potential of noni juice exerts antipsychotic, antifungal, antibacterial and anti-inflammatory effects which are valuable in treating conditions like arthritis and disorders related to central nervous system. Since thousands of years, the natural healing power of this juice has been esteemed for its ability to keep theskin healthy, boost energy levels and prevent general body weakness, accelerates wound healing and toughens the immune defense system of the body. Noni juice is derived from the fruit of a small evergreen plant called noni, also known as Indian mulberrynormally found in global subtropics and tropics. Botanical name Morinda citrifolia, noni belongs to the Rubiaceae family and is privileged as the ‘queen’ of the Morinda genus owing to its conspicuous attributes, versatile nature and distinctive capability of spreading itself usually on the seashores without requiring much human intervention. It is often one of the earliest species which grow on the freshly deposited lava flows typically in Hawaiian regions. The historic beginning and geographic dissemination of noni juice in the pacific islands traces back to thousands of years. Until the later part of twentieth century, noni plant was just used for dyeing clothes before its intriguing therapeutic value took its position at the forefront of alternative medication. Since then it has been admired as a focus of the Polynesian conventional medicine and is deliberated as a sacred healer among the Hawaiians for every plausible imbalance. In the recent years, juice of noni has been a part of discussions and speculations globally attributing to its unique healing characteristics however, its true therapeutic potential is yet to be discovered. Noni tree is more like a shrub or small tree with its height ranging from 3-10 m. It has rounded branches, dark shiny leaves, reddish-brown seeds, small groupings of edible white flowers which in due course progress into a few-inches long, potato or egg-shaped greenish white fruit carved with many round grooves. Noni juice offers an impressive gamut of healthful vitamins, minerals and other phytonutrients. Vitamin content of noni juice include vitamin B1 (thiamine), vitamin B2 (riboflavin), vitamin B3(niacin), Vitamin B5(pantothenic acid ), vitamin B6, vitamin B12, vitamin C (ascorbic acid), folate, vitamin E (alpha-tocopherol) and beta-carotene. Mineral content present in noni juice include calcium, potassium, magnesium, iron andphosphorus. Along with this, the abundance of natural chemical constituents and an inspiring range of antioxidants such as quercetin, vanillin, pinoresinol, proxeronine, kaempferol, isoscopoletin, bisdemethylpinoresinol and scopoletin accentuate the entire nutritional value of the noni juice. Antioxidant potential: Noni juice has a tremendous anti-oxidative potential which seeks out for the oxygen free radicals and neutralize their negative effects. A research conducted on the patients with heavy smokinghabits making them vulnerable to many diseases have advocated the protective effect of noni juice in improving the radical scavenging potential of their bodies and providing relief from the diseases caused by oxidative stress. Cancer: The anti-cancer qualities of noni juice have been traditionally trusted and advocated by the modern science. Various clinical and laboratory research have suggested the chemo-preventive properties of noni juice in the prevention of various cancers such as lung cancer, liver cancer and renal cancer owing to the abundance of healing antioxidants. As supported by another scientific finding, effectiveness of noni juice in reducing the risk of cancer attributes to its ability to block the carcinogen-DNA binding and prevent adduct formation. 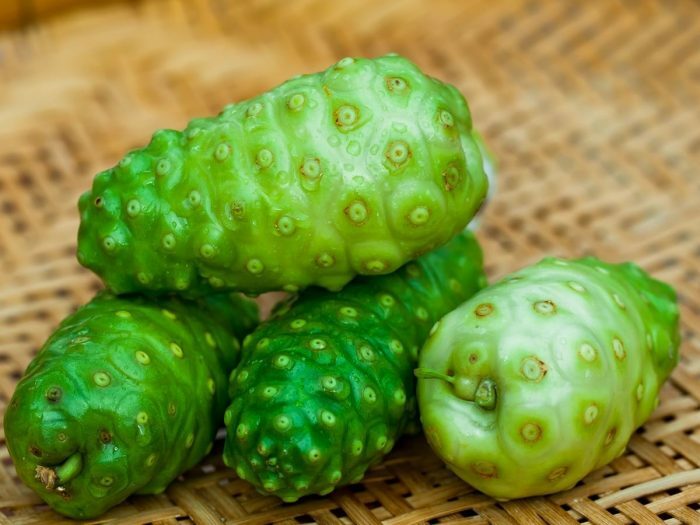 Furthermore evidences have revealed the efficacy of noni juice in retarding the tumor growth in mammary glands by significantly decreasing the weight and volume of the tumors in the subjects.